If you're thinking this sounds like a bit of a whacky book, you'd be right. This is the debut novel by Simon Ralli Robinson. Simon is quite political, and writes about various conspiracy theories allegedly lying at the heart of Government. He has recently won the endorsement of David Shayler, the ex-intelligence operative, who publicly revealed the British plot to assassinate General Qadafi of Libya some years ago. 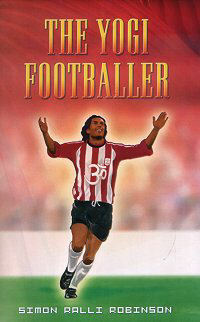 That said, "The Yogi Footballer" is not quite the book one might have expected from the pen of Simon Ralli Robinson. It is an enjoyable fictional romp about a fabulous young footballer, named Ben, whose brilliance on the pitch is enhanced by his almost supernatural yogic powers. Robinson's style of writing here is easy-going and informal. He tends to glorify the 'perfect game', and writes as though from the perspective of an ardent fan of the sport. For the first two-thirds of the book this point of view dominates, allowing a similarly-minded reader to enjoy the basic story of Ben's rags-to-riches journey. The main character is a Nepalese boy, who is adopted by a British couple travelling to the area around Varanasi, in India. The boy is clearly gifted from a young age, having a wise head atop young shoulders. His sporting talent seems to know no bounds, but he simultaneously follows an unusual parallel journey of self-knowledge. The final third of the book takes a number of rather incredulous turns. Ben becomes a messianic figure on the world stage, after 'wowing' football fans the world over with his remarkable agility and talent. He is sort of a cross between Eric Cantona and Jesus Christ! He uses his fame to promote transcendental ideals, and eventually his powers are called upon in a battle against evil. This is where Robinson's nose for conspiracy comes in, as he weaves a dark web of Establishment power and corruption. In Dan Brown fashion, he mixes fiction with controversial factual material. One is left with the sense that the book's informal style and glamorous storyline is a bait: the football story becomes merely a vehicle to entice the unsuspecting reader to consider more challenging material. I think that this is quite a good approach for the author to take. However, where I think he falls down is his very informal writing style. It detracts from the story, even though it allows the pace of the narrative to be well maintained throughout. The style becomes more formal in the 'Author's Notes' section at the back, which I found eminently more readable. It makes me think that Simon Ralli Robinson's ability to write has greater potential than the main text of 'The Yogi Footballer' suggests. His ideas are imaginative enough for further novels, for sure, he just needs to tidy up his prose. 'The Yogi Footballer' also needs serious editing. For instance, one would have to search a long time before ever finding a "tomb" in a library. But, in general, the role of an editor in the production of a book is going the way of the dodo across the publishing industry. More and more respected publishers are leaving it to the authors to polish up their own books, rather than bringing in the services of a professional proof-reader. Typos will become more prevalent in literature over time, perhaps inevitably reflecting our more informal texting-friendly culture. It is not just self-published books that have this problem these days.